All reservations must be made 48 hours prior to the beginning of the reservation. For example: A Friday night reservation must be made Wednesday. A limited number of walk-in lots are available on a first-come, first-serve basis. Individual sites become available both online and through the reservation call center 340 days prior to the start of the reservation. Hours: 10:00 a.m. to 7:00 p.m. (Eastern) Monday through Friday. 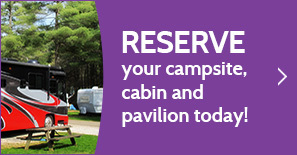 Reservations can be made by calling the reservation call center at 1.855.U-CAMP-OH (822.6764). Several sites may be reserved with a single call, but payment in full is required before a confirmation is made. Payment of a $100.00 deposit for each weekly vacation cabin reservation must be made in full at the time of the reservation. The remaining balance must be paid fifteen days prior to the arrival date. Any reservation made within fifteen (15) days or less of the arrival date must be paid in full. There is an $8.00 per site non-refundable reservation fee.